Named after the mountainous New Mexico city, the bold styling of the first generation Hyundai Santa Fe got the model known in a sea of vanilla SUV-crossover models. For the second-gen designers, they decided to play it safe. The styling is so anonymous, you’d probably have to look at the badge to check what it is. Nonetheless, these capable load-luggers are among the most popular Pacific Rim vehicles in the used car trade thanks to better than average reliability and a (very desirable) option of a third row of seats. While generally reliable, the diesel engines don’t suffer neglect well and manual cars can eat DMFs, due in part to the popularity of this range as a towcar. Strangely, it seems that the spark plugs fitted at the factory on early cars were prone to breaking on removal. The plugs in question are Motorcraft PZT 2FE featuring an unusual two-piece design. Website aa1car.com explains that the crimped lower electrode shell that becomes coated with carbon, causing it to stick in the cylinder head. Rust and corrosion on the lower plug shell can also cause it to stick. When you attempt to unscrew the plug, the lower shell can twist off and get stuck in the head. If you are going to be looking after a number of these vehicles it might be worthwhile investing in a small tool that has been developed to extract it. Snap-On produce one in the US, if you ask your local rep, they will order it for you. Once you’ve got the OE plugs out, don’t refit like- for-like. Use one piece items (NGK, Denso, Bosch and Champion all produce good quality plugs that won’t break). Some models had a 2.7 litre petrol engine known as ‘Mu’. This was an all-alloy V6 similar to an earlier DOHC Hyundai design, but with the inclusion of continuous variable valve timing. However, this must be rare as we couldn’t find any for sale and website howmanyleft.co.uk indicates there are only around 300 registered. Pre-2010 diesel engines were 2.2 litre four-cylinder common-rail units that came fitted with a variable vane turbocharger that has a timing belt that needed replacing every four years or 50,000 miles. This was replaced for the 2010 model year with the more powerful and refined ‘R’ type engine that replaces the timing belt with a chain and features piezo direct injection. As most vehicles in this range are fitted with a common rail diesel engine, it is perhaps unsurprising that most reported problems relate to the usual causes of contaminated fuel and carbon build-up. The Honest John website notes that it is vital to drain oil via the sump plug on this range rather than using a siphon as a tar residue can build up with inevitable consequences. Tec RMI note that Engine 2.2 CDi-R can suffer from non starting with following fault code P0611 (Fuel injector control module) stored. This is symptomatic of a faulty engine control module. Early gearboxes are not the Santa Fe’s strongest suit. At launch, the second-generation car had a choice of four-speed auto on petrol models or a five-speed auto on diesels, or a conventional manual. The automatic gearbox was derided by journalists as being dated (most VMs by this stage offered five- speed ‘boxes). However, the unit itself is relatively trouble free, although care must be taken to ensure the correct SP III ATF fluid is used. The manual ‘box has reports of being low gears being too low – although this is probably down to customers expecting a big SUV to feel the same as a small hatchback. 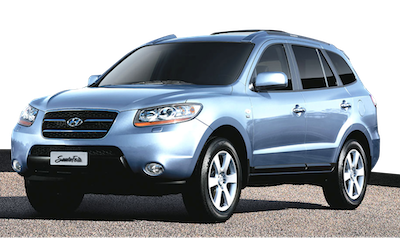 Santa Fe’s have always been popular for towing (many were bought specifically for this purpose due to winning numerous towcar awards) DMFs do wear out and the master cylinder is known to give up the ghost occasionally, so bear this in mind if you are taking one in part exchange. Later models had a five-speed automatic and from 2010, a six-speed which was noted in contemporary reports for a harsh change. The manual gearbox has always been noted for a notchy change, but if this is overly pronounced it is due to a production defect on the shroud of the gearchange mechanism, according to TecAlliance. The only solution is to detach the linkage from the gearbox and replace the shroud. Another well-known drive train issue on manual cars is the cruise control. When these cars were still under warranty Hyundai attempted to repair it by replacing the module, but the problem seems to stem from the clock spring. Only one DVSA-led recall affects UK-registered Santa Fe’s and it relates to an issue where the bonnet could chafe a fuel hose. The answer is a simple securing clip and it applies only to early facelift (2010) models. In the U.S the model didn’t fare so well as it had no fewer than ten safety recalls, mostly related to unexpected stalling. Hyundai itself recalled a number of Santa Fe’s where brake switches may fail according to The Car Buying Group. This could result in brake lights not illuminating & cruise control not disengaging under braking. It’s a heavy vehicle, so perhaps it is no surprise that front suspension arm bushes are prone to wear, as are other parts of the set-up. Other than this, we have no particular problems to report. However, if you take one in part exchange and the tyres are shot, be warned that the 235/60 R18s it requires will set you back £90-£100 per corner. Tec RMI say that if ABS / ESP warning lights are illuminated and C1260 fault code is stored, then incorrect calibration of steering angle sensor might be at fault. The OE head unit isn’t the best, particularly on the earlier models. There’s no RDS and reception is poor. A third row of seats (to make a seven-seater) was a £1000 option when new and is desirable to find today. The spare wheel is underslung under the vehicle. We’ve heard a couple of accounts of the spare being nicked and a replacements being difficult to source, so check it is in situ before doing anything to a customer’s vehicle. TecAlliance explain that another problem is moisture in the passenger compartment, which is caused by the condensation water drain hose from the interior ventilation system, becoming twisted and not allowing the water to escape. Generally, slackening the clamps and running the drain hose smoothly, before retightening the clamps can easily overcome this problem. Dealer Chain The Car Buying Group report that sun visor mechanisms in earlier models could wear out prematurely, causing the visor to drop under it’s own weight and that the fuel gauge sometimes sticks, requiring a replacement tank float. As mentioned, this range is popular with families that require a heavy towcar and any vehicles that pass through your care will very likely have a towbar fitted. Even the oldest first-generation Santa Fe is required to only be fitted with E-marked units (the ruling applies to cars built from 1998 and the Santa Fe was introduced in 1999). Don’t forget that correctly functioning towing electrics are also now part of the MOT.